Wolves sets are usually comprehensive, and this year’s is no exception. 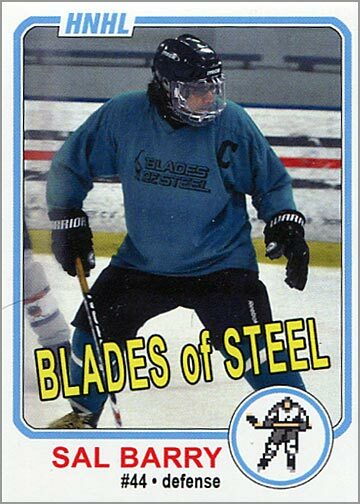 There are 26 player cards, a card of Head Coach John Anderson, cards of assistant coaches Mark Hardy and Brad Tapper, a card of General Manager Wendell Young and even a card of Team Mascot Skates, for a total of 31 cards. That is a lot of cards for a free giveaway set. 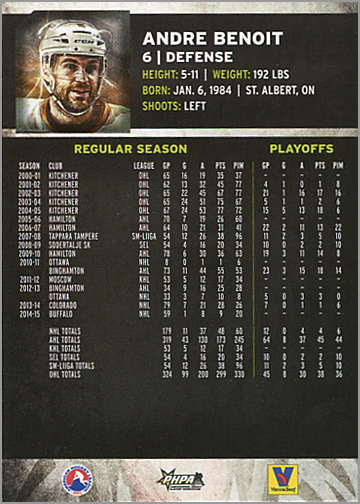 Each card front has a waist-up action photo of each player, with their name, number and position at the bottom. 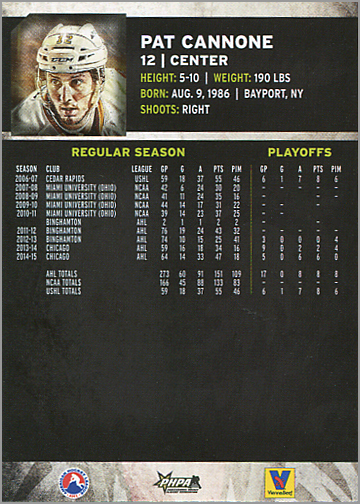 Instead of putting the Wolves logo on the card front, the team’s slogan for this year — “Hungry for More” — is in the upper-right corner. 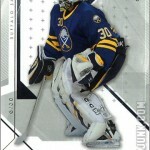 But really, it is all about the photos on these cards. The photographs have their color saturation and the contrast ramped up, giving each card a gritty, yet artistic, look. 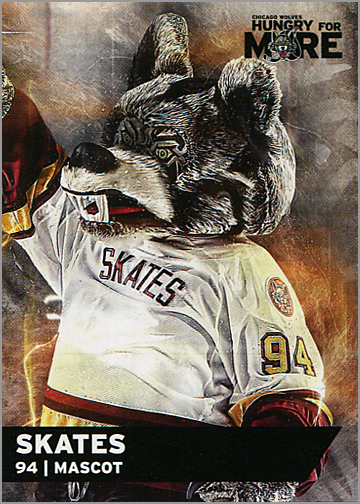 Panini used to do this technique a lot with their Score hockey cards, but the Wolves cranked this aesthetic up to “11.” The Wolves players are placed against a blurred background. There are also fire and lightning in the background, making the photo even more epic. 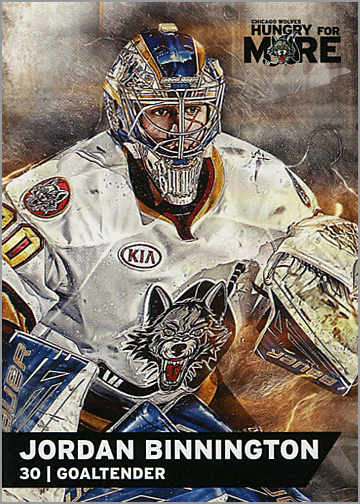 Overall, these cards are reminiscent of the fireworks and laser-light show that happens before the start of every Wolves home game. The relatively-normal typography for the text grounds the design, mitigating the chaos a bit. 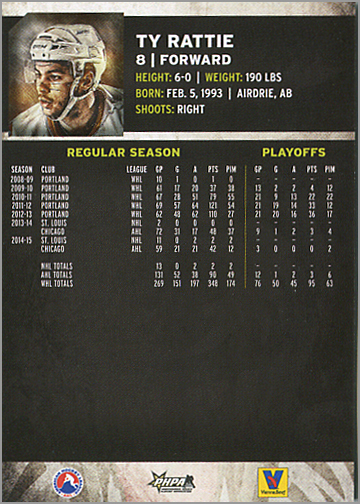 Players’ complete statistics are on the back — and by complete, I mean complete. All statistics are shown, extending back to a player’s junior or collegiate days, plus all professional levels of play, including any stints in Europe. At the bottom, career totals are broken down by league. Listing comprehensive stats is great because you can get up to speed with where else a player has been and get an idea of their career trajectory. 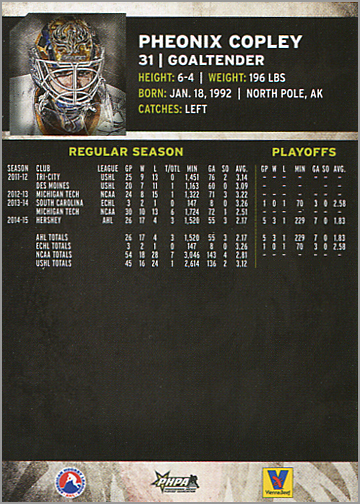 Also on the back is a small head shot (just a crop of the front photo), and the player’s height, weight, birth date, birthplace and if they shoot left or right (or catch left or right for goalies). 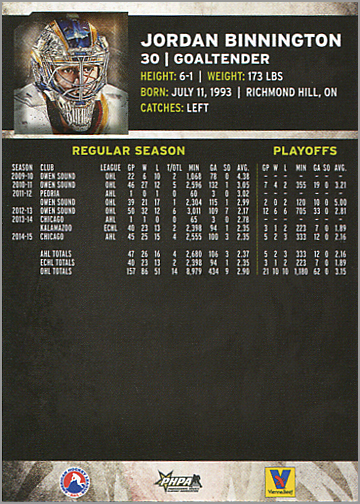 The only downside to these excellent cards is that the stats are so small, while team names are printed in ALL CAPS in white letters against an off-black background, thus making the text difficult to read. 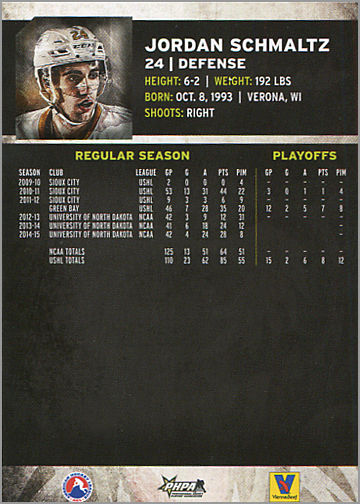 Had the stats been printed in black text on a white background, they would have been much easier to read; though I respect that the Wolves were trying to achieve a certain aesthetic here. 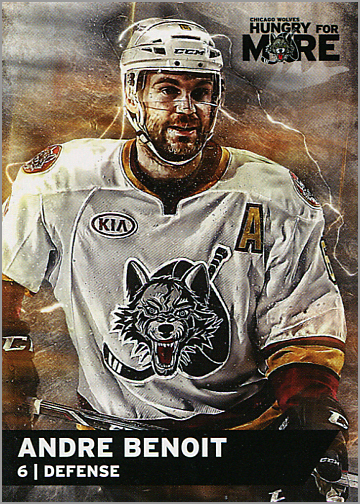 The 2015-16 Chicago Wolves team set was given out to the first 2,500 fans who attended the Wolves game against the Lake Erie Monsters on Saturday, April 2, 2016. 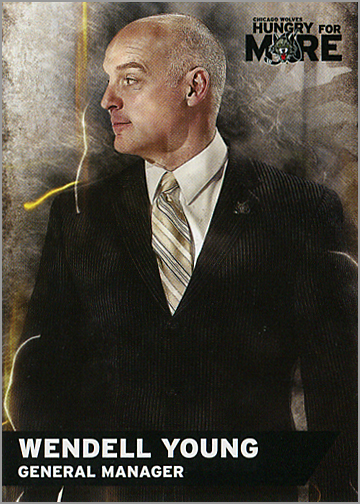 Coincidentally — given the look of these cards — it was also Marvel Superhero Night at that game. While design, player selection and information are all top-notch, the Wolves were a pretty forgettable team in 2015-16. The team missed the playoffs and did not have too many NHL-ready prospects. 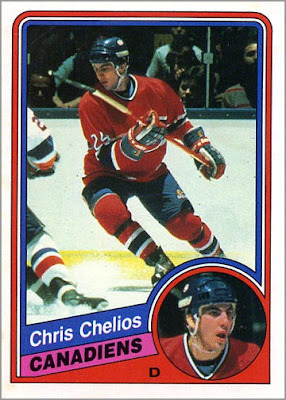 Regardless, die-hard collectors of Wolves, Blues or minor league cards will like this set, which looks better than a lot of the NHL cards on the market now. My five favorite cards in this set. 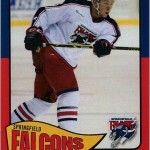 Ty Rattie – Rattie was selected by the Blues in the second round of the 2011 NHL Draft. In 13 games with the Blues this season, he put up four goals and two assists. 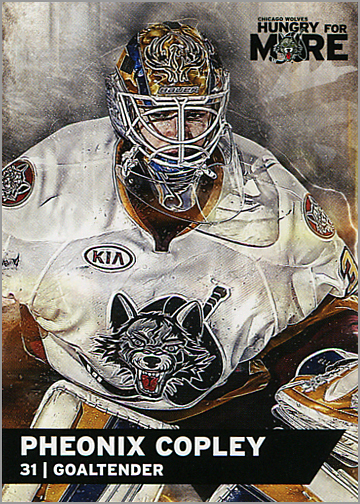 Rattie scored 46 points (17 G, 29 A) in 62 games with the Wolves this year, and may become a regular on the Blues next season (see back). 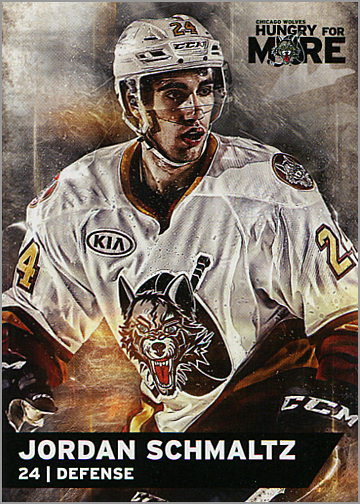 Jordan Schmaltz – Selected by the Blues in the first round (25th overall) of the 2012 NHL Draft, Schmaltz completed his first season of pro hockey in 2015-16. 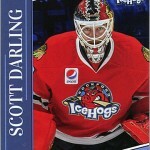 He was a First Team All-Star in the USHL, and a Second Team All-Star while in college with the University of North Dakota. A little more seasoning, and Schmaltz may make it into the Blues’ lineup soon (see back). 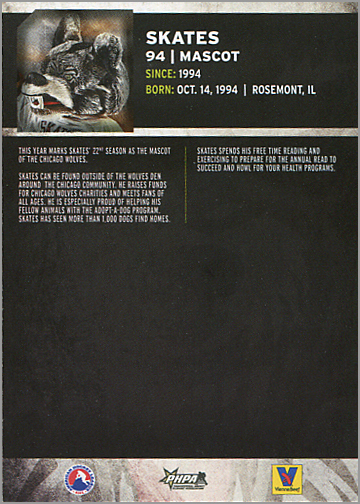 Pat Cannone – Cannone led the Wolves in scoring this season and is the team captain. 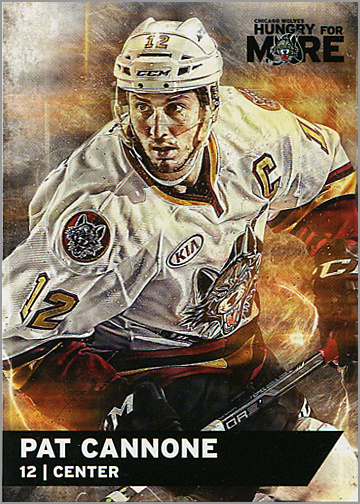 Everything about this card rocks, from the steely gaze on Cannone’s face, to the action-oriented pose, to the “flames” in the background. 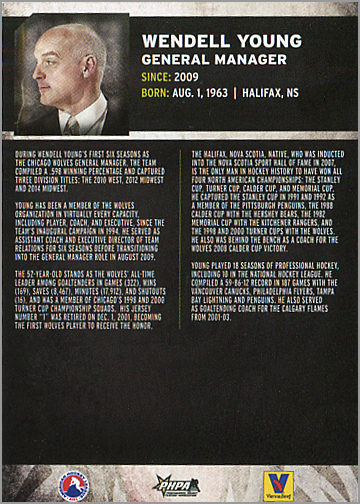 I wish my hockey card looked this good (see back). 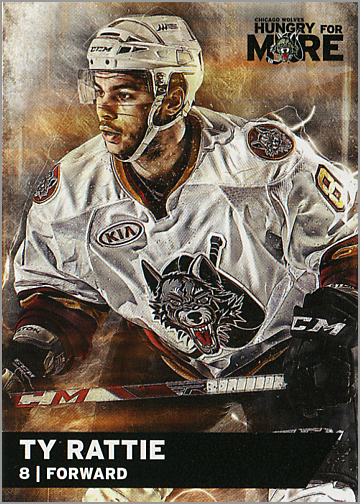 Wendell Young, General Manager – You might think it would be ridiculous for a minor league hockey team to include a card of the GM in their team set, but Young is still very popular in Chicago. 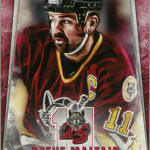 He played with the Wolves for seven seasons and was the first player to have his jersey number retired (see back).